The Skinnie Hegemony has mobilised for war and now aims to bring its own brand of civilisation to every corner of the Federation. Utterly alien, their society and technology is anathema to everything the Mobile Infantry stands for, and peace can never exist between the two species while the borders of their great empires clash. The Skinnie Army Book reveals this race as never before. Once thought to be mere raiders and pirates, the Skinnies have gathered their tribes and amassed their forces as they join the Battle of the Species. Inside these covers, you will find details of the Skinnies tribal origins, how their leadership affects every aspect of their society and the finely tuned technologies they command. From the common Militia to the highly trained Venerables, every Skinnie has dedicated itself to the rise of the Hegemony. 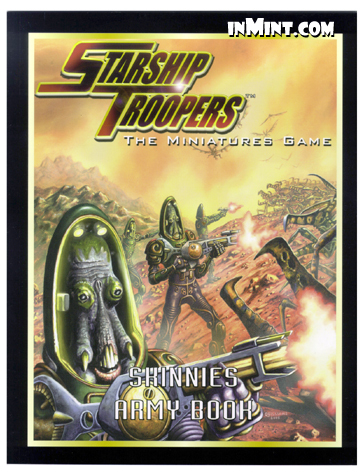 Skinnies Army Book is a sourcebook for Starship Troopers: The Miniatures Game and you must possess a copy of Starship Troopers: The Miniatures Game to use the contents.